You will receive an email when the analysis is complete. Files sent to Enlis will be stored securely in an encrypted format. All data will be deleted after 14 days. * A valid email address is required. All communication and data delivery will use this email. Enlis values your privacy and will not sell your information to a third-party. Need to import a lot of data? Don't want to transfer your data online? 1. Upload your variation data to our encrypted servers. Your data is automatically analyzed, annotated, and converted into our fast, efficient .genome format. 2. You receive an email with a free genome report, and a link to claim your fully-annotated .genome data. 3. If you wish to explore futher, purchase and download your .genome file. Then, load the .genome file in our Enlis Genome Research or Enlis Genome Personal application. You will receive an email when the import and analysis process is complete. Why do I need to upload my data to Enlis? Our genome import and annotation process uses some very large custom-curated databases to connect your data with the latest information. It's not practical or cost-effective to send these databases to every user. Does Enlis keep or sell my data? Your privacy is very important to us. We temporarily store the raw data that you upload to us, as well as the imported, annotated data that we generate. In general, we store this data for 14 days to give you an opportunity to decide if you would like to purchase the imported data. We do not provide or sell your data to any 3rd parties. There is no cost or obligation to receive your free genome report. What are the next steps if I decide to purchase my annotated genome data? Can I try the software before I buy my imported genome data? 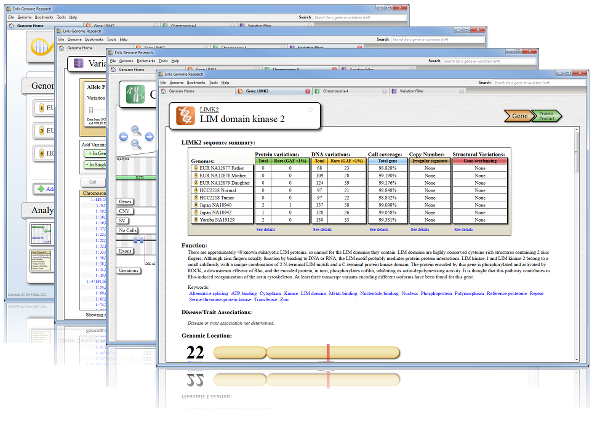 Head over to the download page to get the Enlis Genome software. The software includes 3 sample genomes, so that you can test out all the functionality. What are the system requirements for running the Enlis Genome software? Hard drive space: The software requires 1.5GB of space (this includes the 3 sample genomes).